Refreshing little mint chews that come individually wrapped each depicting a Minties moment. Whether embarrassed? Shamed? Or Mortified? The only thing to do is reach for the Minties. Over 500 million are consumed each year getting people through those sticky situations. Also are 99% fat free. Glucose Syrup (From Corn), Cane Sugar, Gelatine, Peppermint Oil, Palm Oil. 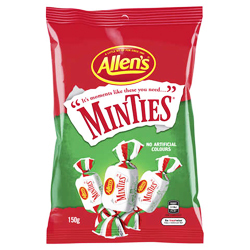 My wife Diane came back from Australia last month and brought me back a bag of Minties and I am now addicted to them.